The world of fabrics can be confusing and intimidating if you don’t know your way around. That’s why salespeople like it; they can intimidate you into buying. They are throwing out terminology that you don’t quite understand and are too embarrassed to ask about, and count on that to woo you into the purchase. On the other hand, we actually like to explain the intricacies of the suiting world. Like how a suit is constructed, what a poor-fitting suit looks like and how we’re going to make you a fantastic fitting suit, because the more you know about the construction and fit, the more you will appreciate what we do. But we also go into detail about the types of fabrics we offer and how they are made so you can become a better critic of fabrics and understand the what’s best for you. Keith Magna looking at Loro Piana’s Spring/Summer collection. The four main components that make up a fabric: Super Number, Weight, Weave and Yarn. Once you understand these four concepts, you’ll know much more than the average sales person and be able to know what fabric is going to serve you best. Dyed wool that has yet to be spun into yarn. Super numbers are usually the first thing you’ll hear about in regards to a suiting fabric and generally notated on the back of the fabric as “Super” followed by a number 80 through 250, and sometimes an “S” followed by a number. This refers to how fine the individual strands of wool are, which are later spun into yarn, then woven into fabric. Now, as you can imagine, the finer the fabric is going to be softer, but that’s also going to affect the cloth's durability. Very fine fabrics, like Super 180+ won’t stand up to everyday wear as well as a Super 120 or Super 130. For a suit you’ll be wearing once per week, we suggest going with a fabric between a Super 120 and Super 170. This way, you’re still wearing a fine cloth that feels great to the touch, but is also durable to stand up to a weekly beating. However, if this is a special occasion, like a tuxedo or a wedding suit, we recommend finer fabrics that are soft to the touch, like a Super 180 or Super 200, that will make you look and feel your best. The Super numbers world can be pretty interesting the more you look into it. There’s a distinction between Super and S, that we didn’t get in to, as well as the shady underworld, like name brand stores lying about their Super count. That’s all covered in the NFTL Super Numbers article here. But either way, the knowledge you have now puts you head and shoulders above your average sales person. The weight of one yard of fabric, in ounces or grams, is going to tell you which season it’s most appropriate for. We personally prefer grams, because it’s a more detailed approach, but older English mills tend to refer to their fabrics in ounces. The typical range of fabric weights are going to be between 175g and 320g. Of course there are heavier and lighter fabrics, but the majority of fine suiting fabrics will be in this range. Heavy weight English fabrics designed for warmth. Anything over 300 grams should be worn only in winter. How dense the fabric is woven, its composition, and how it’s finished is going to be the determining factors in the fabric’s weight. So contrary to popular belief, just because you have a high Super number fabric does not mean your fabric is going to weigh less. The English mills, like Huddersfield and Holland & Sherry, tend to make heavier fabrics because, before HVAC, the fireplace and your clothes were what kept you warm. Utilitarian fabrics, like tweed (which can only be woven in Scotland) and donegals also tend to be heavy fabrics. The Italians, however, have milder winters and hot summers, so their fabric tends to be lighter in general. In the 1930s, Italy created its own style based out of Napoli, which created bold and light weight fabrics to reflect the area and that style has prevailed ever since. So how do you know what fabric is right for you? Light Weight: 225g-250g — Good for the tropics and summer time, as well as tuxedos. A typical year-round weight is between 225 grams and 285 grams (8 oz to 10 oz). Being in Detroit, there are only a couple months in which the weather is “four seasons” worthy. So we prefer to wear over 300 grams (nice and heavy) in the winter time and, during the hot summer months, we choosing lightweight wools (under 250 grams) as well as specialty fabrics like linen and cotton. For more info on summer dressing, see this article, and for more information on fabrics to choose from in the winter, see this. Next is the weave of the fabric. The gives the variances we see in wool suits, from the standard wool you see every day, to hopsack suits, to sharkskin suits. 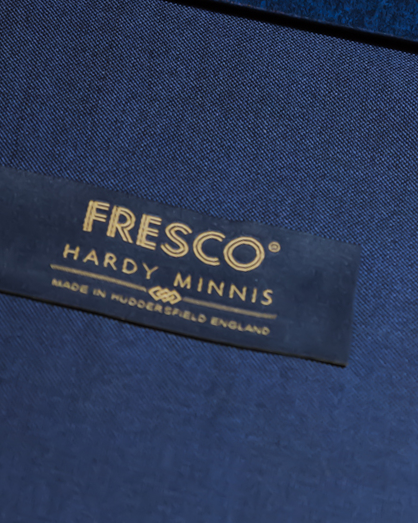 Fresco fabrics, trademarked by Martin & Sons, now owned by Hardy Minnis, creates an open weave that is very durable and breathes easier. Standard wool suits are created by weaving yarns over and under each other. The threads running vertically are called the warp, and the threads running horizontally are called the weft. When the warp and the weft are woven together, they leave tiny gaps that allow air to pass through. However, over time these tiny gaps will fill because the yarns being used will start to lose their cylindrical shape and flatten out. To combat this problem, in 1907 an English mill called Martin & Sons developed a method of reinforcing each yarn by wrapping another yarn around it, then weaving them together. This reinforced the cylindrical shape, and created a tighter and denser yarn. The result is a more hopsack like suit, sometimes called Fresco, Crispair, or Doppio Ritorto, depending on what mill is making it. Tuxedo fabrics are usually woven with white yarns, as well as silk, to give a sheen effect. When other yarns besides wool are included in weave, that can change the appearance of the suit and create a “sharkskin” appearance, or a summer weave. Most tuxedo fabrics, or sharkskin fabrics, are woven with silk in the weft, as well as white yarn, which can give a fabric its sheen. Linen and cotton are often woven used into summer fabrics which will reinforce the tiny gaps to allow more air to pass, but can also create a more coarse fabric. Lastly is how the yarn is made. There are two main methods; combing and carding. Wool has been in use for thousands of years by man, and to process it, combs were used to get rid of the debris in the wool as well as straighten them out for twisting into yarn. Combing is still used to this day to create the majority of wool we see today. When you see the term “worsted wool,” this is referring to wool which has been combed. The other method is carding, which is fairly recent. The difference between the two is that combing removes short fibers to create long uniform fibers, which result in more durability, while carding includes the short fibers which creates fluffy and delicate fabrics, however is much warmer because it’s able to trap more warm air in the fabric. The invention of carding created the perfect fabric for blankets and jackets, because they are significantly warmer. However, when used in trousers, they tend to pill and break down a lot faster. Previously, it was only possible to have flannel that was carded, but now a days, worsted wool is used to weave the fabric, then an abrasion is applied to pill the fabric and make it more fluffy, creating a durable fabric. The bottom line is if you see the term carded associated with your fabric, you can assume the fabric to be warm, but not as durable as a worsted wool. So now you know the main components of wool and should be able to better-informed choices when building your next suit.